- More efficient muscle growth & repair, which leads to faster recovery after exercise! - Enhances immune system strength! - Helps reduces body fat! GH FREAK™ – Nothing is Stronger! 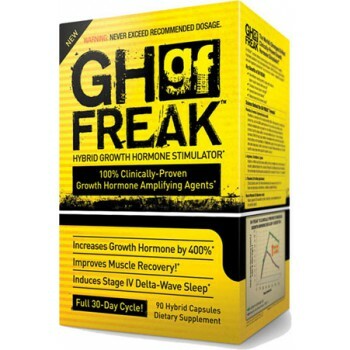 PharmaFreak's GH FREAK™ is hands-down the strongest natural growth hormone (GH) stimulator ever developed! GH FREAK's one-of-a-kind formula contains clinically-proven dosages of the most effective GH-boosting ingredients available! In fact, the ingredients found in GH FREAK™ have synergistic effects and work together to activate the 7 key mechanisms involved in natural GH produc ti on! Stack with Test Freak or Anabolic Freak and take advange of the synergistic effects of Growth Hormone + Boosting Test Levels! Phenibut is a derivitive of the neurotransmitter GABA, differing only by the addition of a phenyl ring. Just like GABA, phenibut is an inhibitory amino acid and has a direct, centrally mediated action on growth hormone (GH) secretion. Research shows that phenibut has the unique ability to increase secretion of growth hormone-releasing hormone (GHRH) through augmentation of neurotransmitter levels in the brain and by direct activity on the hypothalamus. Phenibut also supports immune sytem strength and stimulates deep sleep, which is also known as stage IV delta-wave sleep, and this is the specific sleep phase when peak GH secretion occurs. 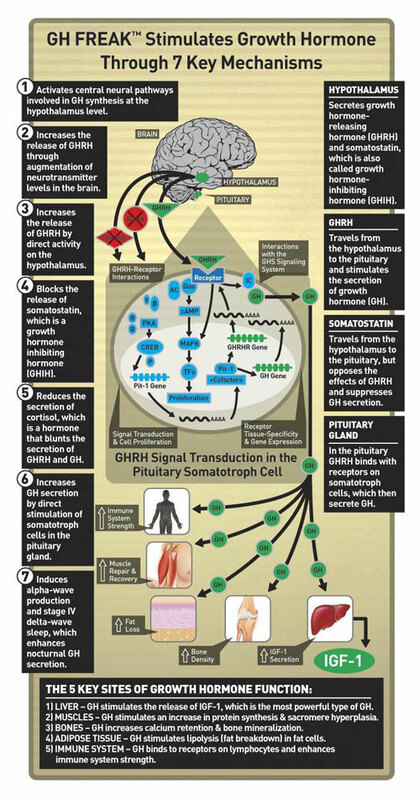 Arginine, ornithine and lysine have a direct, centrally medicated action on GH secretion. A recently published study in the Journal of Strength and Conditioning Research shwos that this combination of amino acids can significantly increase both GH and IGF-1 secretion. Clinical studies show that l-theanine has the ability to increase alpha-wave production in the brain, which has a dual effect on increasing GH output. First off, it suppresses cortisol, which is a hormone that blunts GH release. 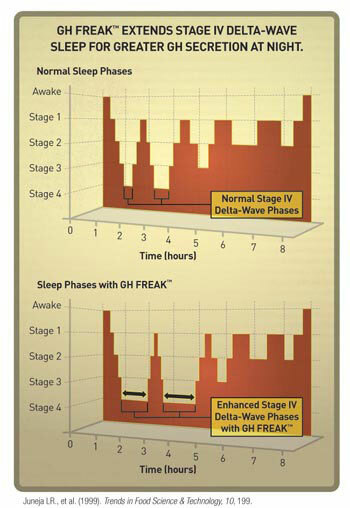 Secondly, it works synergistically with GABA and melatonin to induce stage IV delta-wave sleep. Niacin is an essential B vitamin and supports GH secretion by direct interaction with somatotroph cells in the pituitary gland. After ingestion, niacin has a delayed effect on GH secretion. Therefore, to maximize the GH peak that occurs a couple hours into sleep it makes most sense to take niacin before bedtime. Directions: As a dietary supplement, take 2-4 capsules at or before bedtime to support an increase in growth hormone secretion and an improvement in sleep quality.